England's World Cup hopes were dealt a crushing blow as Wales pulled off a remarkable second-half fight-back to beat the hosts 28-25 at Twickenham. 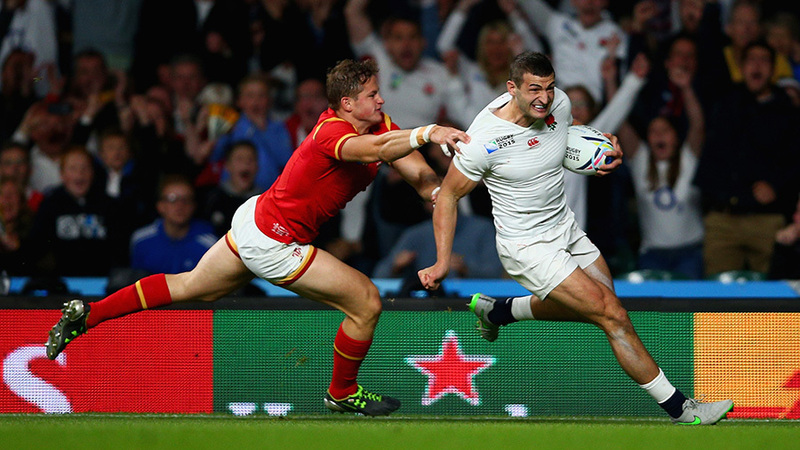 Jonny May's try put England 16-9 up at half-time and the Red Rose led throughout the second half, but a converted try from Gareth Davies nine minutes from time pulled Wales level before Dan Biggar kicked a late penalty to complete an incredible turnaround. The victory puts Wales firmly in charge of Pool A while realistically England will now need to beat Australia next Saturday if they are to reach the quarter-finals. Roared on by a packed out home crowd, which featured Prince Harry, Tom Jones and David Hasselhoff, England made a sloppy start, giving away two penalties within the opening minute and a half, the second of which Dan Biggar clipped through the posts for an early Wales lead. The hosts gradually found their feet, however, as a weaving run from Anthony Watson gave the fans something to cheer before an infringement at the scrum allowed Farrell a long-range kick at the posts, which he slotted superbly to draw level. Wales tried to regain a foothold up front but it was the boot of the fly-halves that was dictating the scoreboard as Biggar missed a drop-goal attempt, then made amends from the tee, before Farrell hit back with a drop-goal of his own, dropping just over the posts for 6-6. Tensions boiled over in the 21st minute as a scything tackle from Dan Lydiate on Tom Wood sparked all sorts of pushing and shoving, with England's Mike Brown sprinting more than 20 yards to contribute to the kerfuffle. Referee Jerome Garces decided no serious punishment was needed but England profited moments later as another Wales foul at the scrum gifted Farrell three more points to put the hosts ahead. The momentum was swinging England's way and there was worse to come for Wales in the 26th minute as excellent work from Brown gave the impressive Ben Youngs a chance to pop down the blind side, where May was waiting to dash into the corner for his sixth international try. Farrell added the extras to put England 10 points clear but Wales finished the half strongly, with Scott Williams making a lightning quick break past Burgess before Biggar kicked his third penalty to reduce the deficit. Courtney Lawes, suffering with what looked like a knee injury, had to be replaced by Joe Launchbury at half-time but England were undeterred as Farrell converted another penalty shortly after the restart. Every time Lancaster's side pulled ahead, however, their indiscipline let Wales back in, as another transgression at the breakdown allowed Biggar to reduce the gap back to seven. The fly-halves exchanged another three points each and as the hour-mark approached, both teams struggled for rhythm with Biggar kicking through the posts again to make it 22-18. After a tentative spell, Wales suddenly sparked into life as George North left two defenders in his wake with a brilliant run through midfield but England broke out under pressure, as Watson drew a sprint race with Hallam Amos, which the Wales man just won to avert danger. Wales lost key players with 15 minutes remaining as Scott Williams and Liam Williams both departed on stretchers while Amos was escorted down the tunnel with what looked like a problem with his arm. 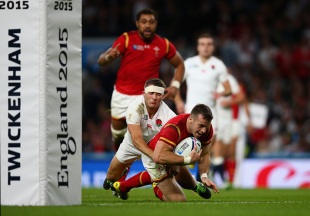 England capitalised, as Farrell kicked his side into a seven-point lead, but just as they looked on the brink of victory Wales stunned the home side with a try, Gareth Davies latching on to a Lloyd Williams' kick and diving over. Biggar converted to draw level at 25-25 with nine minutes left, but the drama was far from over as Wales earned a penalty on the halfway line, which the Red Dragon's number 10 drove high, hard and over the posts to claim an unlikely lead. England rallied in the final moments, pushing forward for one last score, but Wales held on to inflict a devastating defeat on their fiercest rivals.